Looking to plan your first event? Maybe you’ve been planning events for a while but want to ensure you’re using the best possible framework. Understanding the key components, ensuring you have an event plan and creating lists to help you check off all of those last minute details is a system event planners use to ensure success. In this guide we’ll walk you through what event planning is, what it involves and how to write an event plan, step-by-step, with a checklist to help you along the way. Event planning is the organisation of all of the activities that surround an event. This could be a party, a festival, a conference or a tradeshow. Planning an event takes lots of work and key organisational skills. Event planners will often work on everything from catering, to entertainment, booking presenters and managing exhibitors. The event planning process ensures that all of these areas are covered, that the event remains within budget and that it is delivered on time and fulfils the event objective(s). Event preparation – writing an event plan, documenting budgets and timelines and researching suppliers like caterers or staff members. Event promotion – all of the aspects that help to sell the event, raise awareness and increase the number of attendees. On-site event management – making sure the big day (or days) goes without a hitch and that everyone is where they need to be. Putting out any onsite fires! Post-event review – organising debriefs, data collection and analysis and reviewing these against the original event aims and figures. Of course, there are many more individual tasks that fall under the event planning bracket, which is why creating an event plan to cover them all is a great idea. 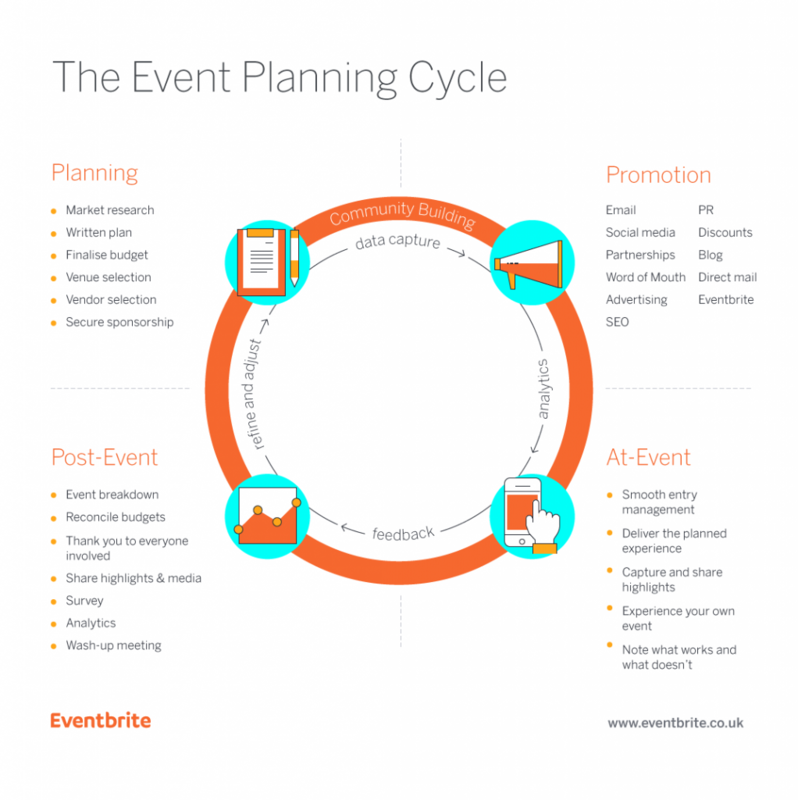 To plan a successful event it’s important to have an event plan. This is usually completed before the event as it allows you to think about the event from start to finish. This is especially useful if you have different teams like sales and marketing, or if you need to present the event plan to other investors. In our event planning 101 toolkit (which you can download at the bottom of this page) we include a copy of a free event planning template. The name of your event. Simple, right? Well, not quite. Before you name your event, think through these questions: Is your event name unique? Memorable? Clear and descriptive so it’s easy for people to know what your event is about? Again this sounds simple, but have you checked to ensure there are no big direct or indirect competitive events on or close to your event date? Have you ensured there are no big bank holidays, religious holidays or other large events? Are you sure the venue is available and at least on hold for those dates? This could be your specific venue, or if you haven’t booked it yet, the intended city or destination for your event. Before you make a decision, consider; have you checked your Eventbrite dashboard to see if you’ve picked the best location based on where your attendees come from? Are there good transport links to the venue? Does it fit with your budget, brand, preferred dates and anything else materially important to the experience of your attendees? People run events for lots of reasons. What is the purpose of yours? Some options include: profit, fundraising, brand awareness, lead generation, networking, education, community engagement, product launch…and many more. Be sure you know what the core purpose and essential outcome of your event is. SMB: We’ve our Product Director to explain all the key features of our latest release, followed by free drinks and food so everyone can enjoy a fun networking evening. Conference: The only place you can hear all 10 of the Top 10 Fast Tack 100 CEOs speak in one place. SMB: Be the very first to hear about our first major product update in 2019, then catch up with your peers as we serve up drinks and food all evening. Festival:Millennials (aged 21-40) with disposable income, active on social networks, typically single. Charity: Anyone who has been touched by the same issue as our members (e.g. cancer survivors, relatives of crime victims, orphans and their adoptive families). The best event marketing strategies follow a timeline and logical sequence, with each promotion reinforcing the last. While every event is different, there are some common tactics that can help guide you as you plan your event project. Start by breaking down your efforts by milestone: pre-event, ticketing launch, day-to-day, and last call. Then choose your channels, including email, social media, SEO, blog articles, partners, press releases, and influencers. Once that’s established, you can map out your schedule. Even if ticketing isn’t launched a year before your event, that doesn’t mean it’s too early to start brand marketing. Looking for a strategic breakdown for your social media plan? Check out our Essential Guide to Social Media for Events. This is the place to detail your headline costs or expected budget, so everyone is on the same page as to what they can and can’t spend and where they’ll need to make savings. Get a proper handle on what you’re spending and manage costs like a pro by using a budget template (we’ve included one in our event toolkit below). Knowing who on your team will be responsible for what months in advance is vital as everything comes together in the planning stage. If you’re not sure where to start, you can refer to a past event that’s similar to your upcoming one to divide the roles and responsibilities. There are also many free event planning productivity tools that will help you and your team stay in sync. Note: Make sure you’ve designated a point person for even the seemingly small things, like updating sponsors on attendance. What might seem like a small task now can become a huge problem if you don’t have a coverage plan when everyone’s bandwidth is maxed out. You may also be tempted to hire a professional event planner to take care of it all for you, but can you afford one? Des Mclaughlin, Divisional Director of Grass Roots Meetings & Events, suggests that event planners charge and the different payment models that can influence the final cost. Fixed management fee: This is a flat rate for the whole project rather than an hourly rate. This requires the agency to estimate how many hours work organising the event will take and caps the fees payable. Percentage of budget: An event planner may also charge according to the total value of the event. They will typically leverage a fee of between 15-20% of the total cost. Return of commission: Many venues and hotels offer commission to agents on bookings. Under this model the agency or event planner passes on any commissions received, to come off the client’s bottom line. Alternatively, the event planner may look to negotiate non-commissionable pricing to achieve a better base price for the client. Sharing of commission: Rather than passing all commission on to the client, the event planner may split the revenue between themselves and the client. Markup on services: An event planner may take remuneration by marking up the third party services it supplies, such as venue hire, catering and AV. This would typically be between 10-15%. Open book client relationship: Where the client has access to the event planner’s accounts so they can check they are not hiding commissions etc. The bottom line is that there are many different payment models, allowing you to choose the one which best suits your organisation and budget. Ready to complete plan your event and begin working out the most successful method to get things launched? Download our event planning package of resources below to help guide you to a successful event for you and your attendees.